You can’t deny that we’re living in a pill popping generation these days, where there is a solution to virtually every ailment (of course, you’ll have to discount diseases like hepatitis, AIDS, cancer, and its ilk). Of course, there are also others who pop pills for the wrong reason, of whom Pac Man is largely responsible. Nah, we’re kidding. Anyhows, to get on with the show, this disturbing trend has now surfaced amongst computer users, but with good reason. 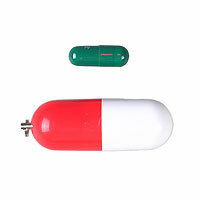 The all pervasive USB flash drive is now available in the classic red and white pill design, but of course the only thing this pill does is store your data and not meant for personal consumption. Capable of storing up to 4GB worth of data, the Pill Shape USB 2.0 flash drive requires no external power supply and sticks to the tried and true plug-and-play technology. It is compatible with all manner of Windows operating systems from Windows 98 onwards and Mac platforms. Apparently the product page mentioned that this unique flash drive was designed to withstand harsh working environments, although no concrete data was given to substantiate this claim. I don’t suppose it would be premature to say that the Pill Shape USB 2.0 flash drive from Vavolo will be a big hit (pardon the pun) with party goers, doctors, and the elderly. For all you know, future iterations could come with a pill reminder for patients, and this built-in timetable is stored on the flash drive itself. If you’re interested in picking one up for yourself, this device retails for $70.